Ikebana Mishoryu-Sasaoka. Welcome to Our Offcial Site! The unique Japanese art of ikebana is not as inaccessible as you might think—in fact, it is available for you to enjoy right now! Western-style flower arrangements generally consist of numerous fully-blooming flowers in very dense arrangements. They present us with lavish displays of blooms at the very peak of their beauty. In contrast to this focus on the peak moment, ikebana arrangements express a sensitive awareness of the passage of time, also including budding flowers that are not yet in full bloom. In time, the buds will burst open, bloom, and eventually wither and fall. In practicing ikebana, we work with the changing phases of a flower's life, from beginning to end, and through this experience, we find that the flowers have much to teach us: From flowers that turn towards the sun and bloom, we learn to live our lives with aspiration, even when faced with adversity. From gradually opening buds, we can learn about the graceful process of aging. To the Japanese, flowers are not a tool for self-expression, but teachers sharing valuable life-lessons. 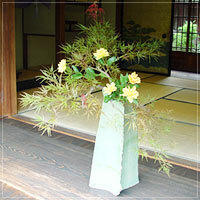 Ikebana is not simply an art form utilizing flowers—it is also a philosophical path. One characteristic of most forms of flower arranging is the progressive “addition” of an increasing number of flowers to complete an arrangement. In contrast to this, the most salient characteristic of the Mishoryu-Sasaoka School lies in a refined aesthetic of “subtraction”—pruning away overlapping leaves and stems to artfully reveal the contours of a single flower, stalk, or leaf. This method can be compared to the “less is more” theory of design espoused by modern architectural master Ludwig Mies van der Rohe, which advocates the creation of impressive spaces utilizing a minimal amount of carefully selected materials. The Mishoryu-Sasaoka School of Ikebana does not preserve its numerous techniques or the multitude of varied and beautiful arrangements created by its lineage of master-teachers as a closely guarded secret—they are shared with the general public. New students are first given a diagram to work from, with annotation detailing the length of flower stems, their placement, and the angles at which they should be set. In their initial classes, students can follow these patterns to recreate the arrangements of revered ikebana masters of the past. This methodical approach to teaching, using patterns, is a distinctive characteristic of the Mishoryu-Sasaoka School, and is often described as a “theory-based” style of flower arrangement. In many Japanese traditional arts, the fundamental patterns to be carefully followed by students, such as the flower arrangement patterns used by the Mishoryu-Sasaoka School, are called kata. It may seem ironic, but one of the main reasons that students dedicate themselves to learning such kata so meticulously is so that they can eventually break free of the prescribed patterns and create something original. This is called kata yaburi—“breaking the kata,” but in order to do this successfully, it is vital that students first thoroughly cultivate their ability to perform the kata. Once they have the strong foundation of those fundamental skills, they are then able to break free of it and pursue a new and original aesthetic. It is at this point that each student�fs individual aesthetic sense is revealed, as well as the unique personal qualities that they have cultivated in the course of their daily lives. The Mishoryu-Sasaoka School of ikebana was founded by Chikuho Sasaoka in 1919, precisely the period in which a new style of flower arrangement called moribana (literally “piled-up flowers”), using garden plants imported from the West, was gaining popularity throughout Japan. At that time Chikuho was the top student of the Mishoryu School, an ikebana school founded in the late Edo period in Osaka by Ippo Mishosai. Chikuho felt that the moribana style did not make sufficient use of traditional ikebana techniques, and so, employing the distinctive isosceles triangle-based arrangement of the Mishoryu School, known as uroko (“fish scale”), he developed the Sasaoka style of moribana. Sasaoka-style moribana is typical of Mishoryu-Sasaoka ikebana in that it is a style which embodies both tradition and innovation. From the age of three, Ryuho Sasaoka received ikebana instruction from his grandfather Kunpo Sasaoka, succeeding him to become the 3rd head of the school in 2011. He is well known for pioneering the potential of ikebana as a performance art, creating arrangements before live audiences at major events in Japan and overseas, including the ceremony to commemorate 150 years of diplomatic relations between Japan and Switzerland, which was held in Neuchatel, Switzerland in 2014. He also supervised the flower arrangements for the venue of the G7 Ise-Shima Summit in 2016, which was attended by the heads of state of several nations. 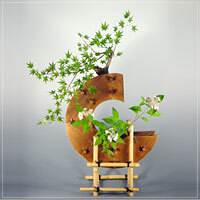 Ten ikebana arrangements, collectively titled Floral Landmarks of Ise, were displayed in the meeting room, waiting area, foyer, and other areas of the venue. 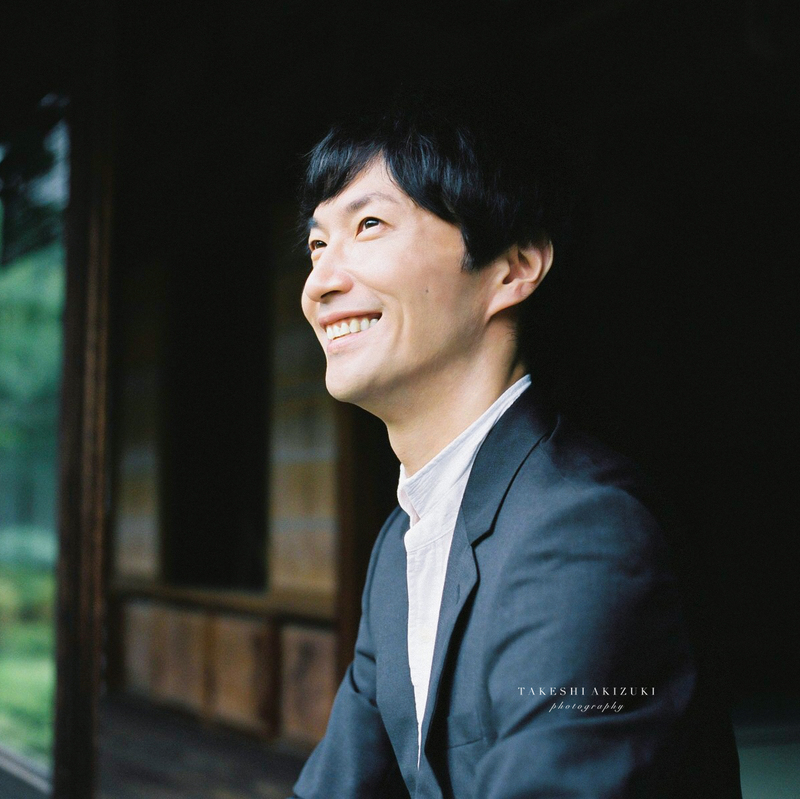 He has authored several books, including Ikebana, published in 2011 by Shincho Shinsho. The representative flower of the Mishoryu-Sasaoka School is the Japanese iris (iris laevigata). In Japan the Japanese iris is called the kakitsubata, and the Mishoryu-Sasaoka School is often called “Kakisubata Sasaoka” due to its association with the flower. According to classical literature, the purple color of the Japanese iris is said to be the same as the harmonious color that tints clouds when sunlight meets moonlight. Since ancient times, it has been highly valued by Japan as its most exquisite flower. The Mishoryu-Sasaoka School's methods of arranging the Japanese iris have been carefully developed and refined over many years, but they are also made freely available. The methods are described in detail in the patterns used in classes, and so even absolute beginners are able to create exquisite Japanese iris arrangements from their very first day of practice. Copyright(C)Ikebana Mishoryu-Sasaoka All right reserved.